The elaborate craftsmanship includes detailed modelling of Tyrion's probing face while he's seated on the Iron Throne, dressed in his regal outfit and holding a cup. The Lannister cake has been sold at a whopping price of Dh100,00 but a marketing staff at BroadwayBakery.com told Khaleej Times that orders can still be placed online from the seven kingdoms, er, emirates. It took three weeks for the cake artists to finish the fondant (thick paste) work but the cake was baked fresh before it was delivered. The cake artists paid close attention to details with each component - from the thousand swords which made up the Iron Throne to the golden locks of Tyrion (played by Peter Dinklage who stands at four feet and five inches in real life) - carefully crafted and painted to give it a picture perfect finish. 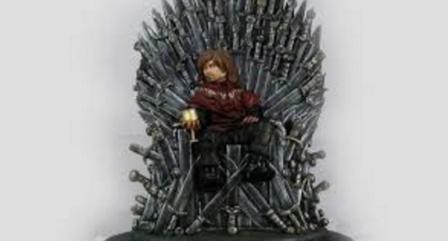 Tyrion was also dressed in his distinctive red jacket with intricate gold artwork. His face is covered with stubbles and there is also a scar up his cheek and on the bridge of his nose which he got after the bloody Battle of Blackwater in GoT's season 2, episode 9. But is the cake entirely edible? The cake weighs 32kg and can serve up to 120 guests. "The cake inside is our signature chocolate flavour, but we can customise it to be any of our bestselling flavours," he added. Orders can be placed on toll free number or through the email id of the BroadwayBakery.com. The Game of Thrones Season 7 premieres on July 16.